Start the day off with brunch at the Lookout Café. While you’re visiting Victoria Falls, it only makes sense to immerse yourself in the experiences around the falls fully. As the name suggests, the Lookout Café was built in a perfect location on edge overlooking the Victoria Falls and Batoka Gorge below. It’s one of the only places to see the falls without actually entering the park. You’ll get the chance to taste some of the signature flavors of Zimbabwe, including the exotic crocodile kebab. Be sure to arrive at the restaurant early enough to get a seat due to the popularity with locals and visitors. Many people begin their journey of the falls at this location because they also provide bookings for various tours and other activities such as bungee jumping. The first sight that you’ll have when approaching Victoria Falls is the towering smoke arising from the falls. Victoria Falls’ native name, Mosi-oa-Tunya, translates to “The Smoke that Thunders,” referencing this phenomenon. 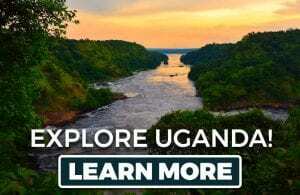 The UNESCO World Heritage site is considered to be the world’s largest waterfall, based on the water volume that flows over the edge into the gorge below. Victoria Falls is located on the border of Zambia and Zimbabwe, flowing from the Zambezi River. It stretches 2 kilometers long with a height of 108 meters from the bottom. It’s become one of the most popular tourist attractions in either country, with visitors arriving to marvel at the natural wonder. The rainy season, between December and March, is when the water flow is at its peak and the smoke cloud at its highest. Other visiting times of the year still provide a great viewing experience of the falls. There are a couple of unique ways to experience Victoria Falls, up close in person. Adventurous visitors would have a lot of fun on a white water rafting excursion along the Zambezi River. If you’re even more daring, stop by Devil’s Pool, a natural made pool right on the falls made from a rock barrier. The “pool” is only a few feet away from the edge, but there is minimal current, making it safe to swim in. It gives the illusion that you’ll flow over, but you can rest along the edge and enjoy the sight with no worries. Since the waterfall straddles two countries, there are two vantage points for Victoria Falls on the ground, both worthwhile to check out. The countries allow visitors day trip access across their respective borders to take advantage of both viewpoints. Book a helicopter flight tour to get a breath-taking view of Victoria Falls from the sky. Take a helicopter high above the falls and circle around to see the complete perspective as the Zambezi River flows over to create the natural spectacle. With Victoria Falls consisting of two African countries, you have a choice of national parks developed around the falls on either side. The Mosai-oa-Tunya National Park in Zambia and the Victoria Falls National Park in Zimbabwe are together considered twin national parks. Half of both of the parks are the actual waterfalls and the surrounding environments, both they both have much more to offer for visitors after exploring the main attraction. 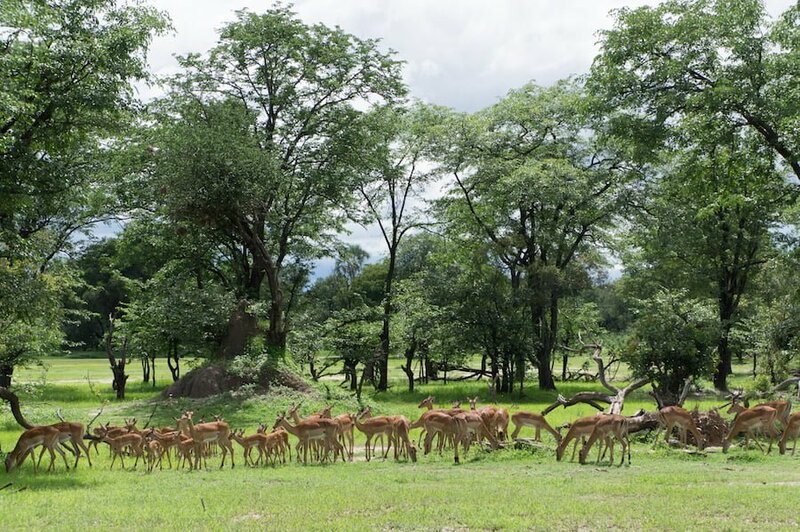 The Mosi-oa-Tunya National Park is the larger of the two parks, with a land area of approximately 66 square kilometers. In addition to the falls, the other half of the park is called the wildlife park, delivering just that to its visitors. The park includes animals including giraffe, zebra, impala, antelope, and many more. Rhinos are scare but still present in some regions of the park. The latest experience developed in the park is called Walking with Lions, where you’ll get near the majestic beasts. 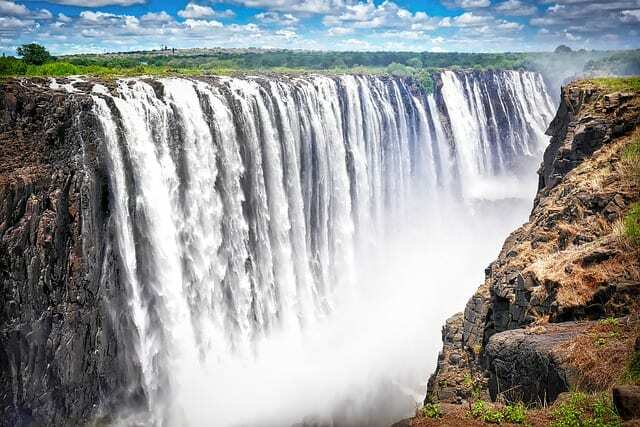 If you find yourself within the Zimbabwe borders, you’ll get a chance to explore more of the Victoria Falls National Park, covering 23 square kilometers. It’s most known for the rainforest covering the entire park, consisting of a variety of trees such as mahogany and various palms and ferns. Animals living throughout the forests are elephants, hippopotamus, eland, buffalo, and crocodiles. Operators in either park offer safari tours, taking visitors around to the popular locations for spotting the big five animals. Victoria Falls is a major tourist attraction with many surrounding developments catering to tourists. The Elephant’s Walk Shopping and Artist Village is a way to escape the tourist atmosphere and connect with the local communities nearby the falls. Elephant’s Walk Village is a shopping plaza filled with specialty shops, boutiques, ad vendor stalls from locals. Browse various collections of local artisan crafts, jewelry, art, clothing, or even go by the taxidermist shop. The complex provides a unique shopping experience for visitors and a great stop during your trip for picking up some souvenirs. One of the facilities included within Elephant’s Walk Village is the Jafuta Heritage Center. The center is an excellent destination for learning more about Zimbabwean history and culture. There are exhibitions of artifacts located here which are free for all visitors. The village also includes various eateries to grab a quick bite before heading out to your last activities for your day at Victoria Falls. 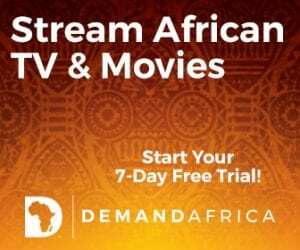 The Zambezi River is good for more than just transitioning into the world’s greatest waterfall. 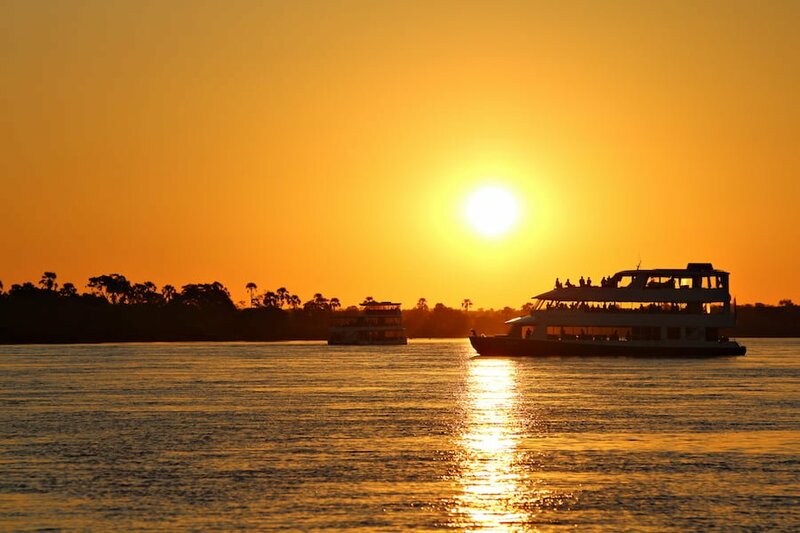 Take a ride along the river for a sunset dinner cruise. You’ll be far from reaching the edge so you can enjoy a peaceful dinner among good company while cruising down the river. The sunset dinner cruises always begin in the evening, just before sunset so you’ll already be out in the water when the sun starts to set. Your captain will take you around to areas for spotting game along the river banks or crossing the river to the inner islands. Snacks and drinks are provided as you prepare for the sunset. Once the night falls, lanterns are lit onboard the boat where you’ll be served a multiple-course, Zambezi-style dinner. By the end of the night, transfers are available to take you back to your hotel accommodation to close out your day at Victoria Falls.